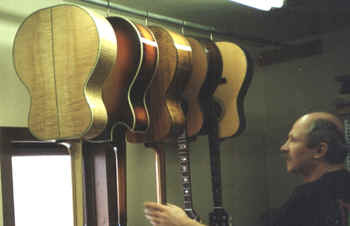 Several finished guitars ready (or almost) for final inspection and shipping. A very fancy maple guitar -- abalone on the top and peghead, very fancy fingerboard inlay. 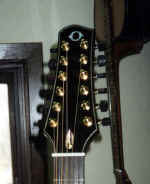 The peghead of the maple guitar. 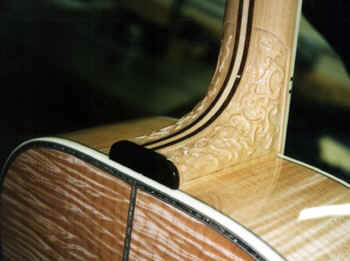 The carved heel and the fabulous maple on the back. 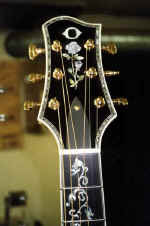 Another very fancy guitar, with a sunburst finish. 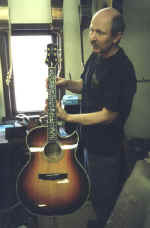 And Jim (who does not have a sunburst finish). Jim's design sense is better than my photography, evidentially. Just a small part of Jim's wood stash.